The Brazilian Central Bank (BCB) just came out with their December 2015 inflation report on Friday, and it got me all bothered to the point where I just had to put pen to paper. As a precursor, one of the BCB’s stated principal goals is to maintain a low and stable inflation rate as a cornerstone for sustainable growth. 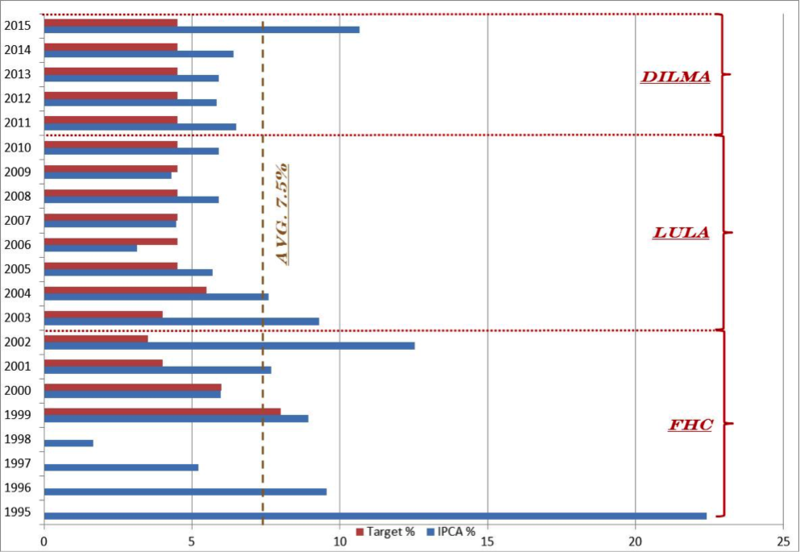 The BCB sets out target inflation rates that have been parked at 4.5% +/- 2% since 2005. Brilliant. The 2015 CPI was 10.67% compared to 6.4% in 2014. As the Donald would say, “That’s huuuuge.” The CPI is the highest it has been since 2002 and is the first time the central bank has missed its target since 2004. It’s a painful reminder of the tough battle ahead to get inflation under control and growth restarted. 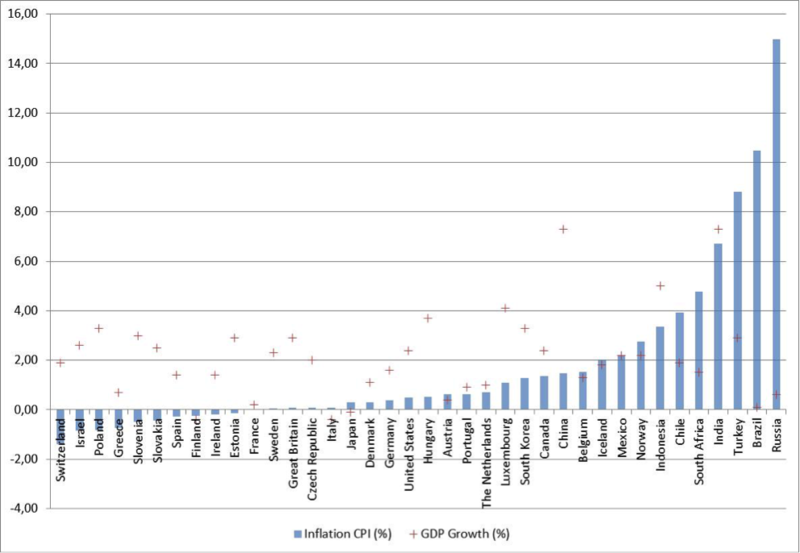 So where does Brazil inflation rate fit in globally with the major economies? It is only trailing Russia, which has an inflation rate of 14.98% through November of 2015. Here is another really interesting graphic from the BCB report that shows inflation for the regulated and market sectors. Market inflation pressures are really being driven by prices from food & beverages (up 12%) and housing (up 18.3%). 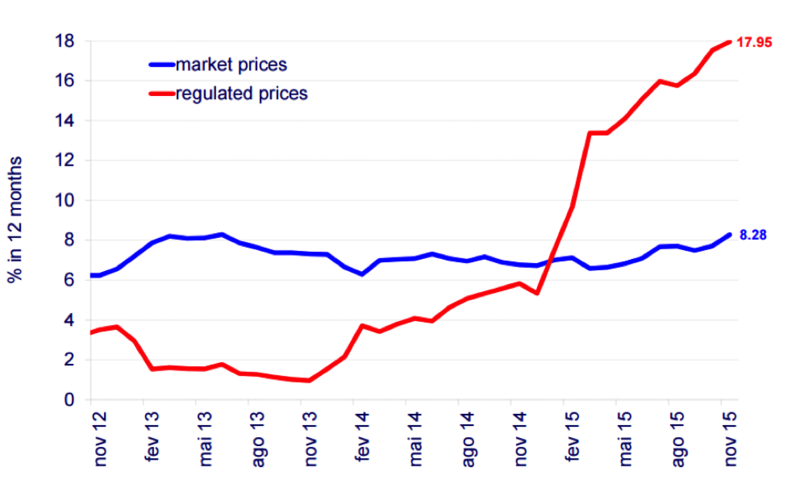 Regulated prices are being driven by electricity (up 51.2%), public transportation (up 10.6%), gasoline (up 19.3%) and water and sewage (up 14.8%). Brazil is one of the few main oil producing countries were gasoline and diesel prices continue to go up even while the price for crude is low and stagnate. Someone has to pay for the billions that Petrobras lost due to corruption I guess. Well, where are we going from here? The BCB says back to 4.5% by end of 2017. Hopeful – yes! But not holding my breath! Lots of things have to line up first. The Monetary Policy Meeting (COPAM) is set for January 19th and 20th so time will tell. The SELIC is currently at 14.25% and has been there since July of 2015. 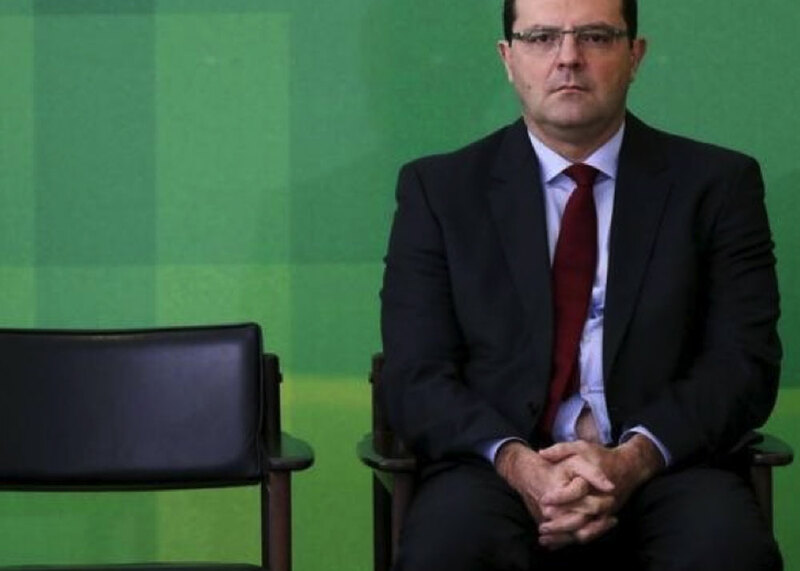 Brazilian Finance Minister Nelson Barbosa said on Friday he will do his part to bring inflation back down to the official target by rebalancing the fiscal accounts and raising productivity. But, to be honest, it’s hard to see that happening with the mixed messages coming out of Brasilia. A couple days earlier when the federal government finally paid back the R$72.4B that they owed the state banks, President Dilma and Minister Barbosa were on the front pages saying they would encourage the banks to start lending out that money to stimulate growth. At the same time, BCB President Tombini is considering raising the SELIC to try to further control inflation. 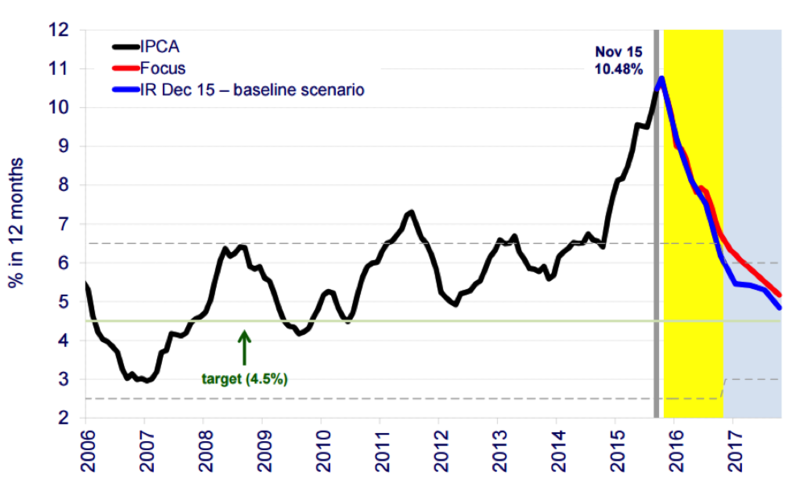 “The central bank will adopt the measures needed to meet the target,” Tombini wrote on Friday January 8th, 2016 in a letter to Minister Barbosa and assured the inflation will hit its target in 2017. The BCB wants to tighten and Planalto wants to loosen. Is it possible to get inflation back to within target range?? You bet, but lots of things have to line including getting the impeachment behind us (she won’t be impeached) and coherent fiscal policy put in place (let’s hope). It should be fun to watch unfolding. BCB President Tombini is in the hot seat after having raised the SELIC 16 times since April of 2013. With the economy struggling, another rate hike will go over like lead balloon. Latest estimates I saw had the SELIC going to around 14.7. It’s great if you park your money in CDs, but not so good if you are trying to jumpstart investment and growth. As ex-Finance Minister Joaquim Levy sails off into the World Bank sunset, I’ll bet he is sleeping pretty good at night.